New York City weddings have something special about them that can not be found in any other setting. This Manhattan Penthouse Wedding lived up to this expectation and proved to be one of the most enchanting weddings I’ve had the pleasure to experience. This charm was partly due to the venue and city scene of the nuptials, but it also was largely a result of witnessing the genuine joy shared by the bride and groom. The autumn day was a bit rainy, but the newlyweds were walking on sunshine after they left the wedding ceremony as husband and wife. This picture was taken during a break in the rain. 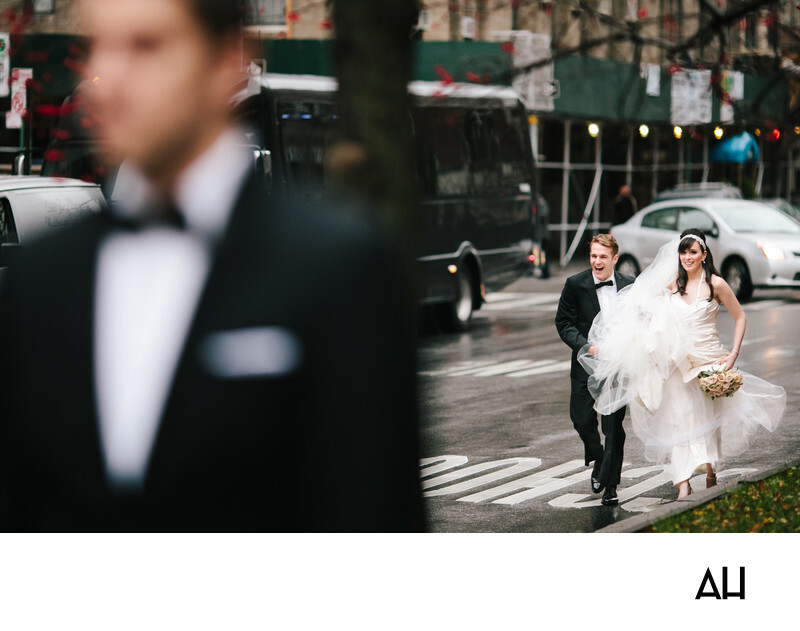 The bridal party had to quickly cross the busy city streets as they left the party bus and made their way toward the Manhattan Penthouse Wedding venue. The bride and groom did not leave one another’s side as the pair ran down the street. The bride had found it difficult to hold her bouquet and to keep the layers of tulle flowing from her gown off of the wet pavement. Her husband, in true gentleman form, helped her to hold her skirts up as they tried to catch up with their friends. The two burst into laughter as they trotted down fifth avenue, the magic of the day radiating from their happy, carefree expressions.